Gov. Tom Wolf announced that he will allow House Bill 1801, a budget plan with no tax hikes and record education funding, to become law without his signature. Since Gov. Tom Wolf vetoed more than $6 billion in funding from the General Assembly-approved budget in December, House & Senate Republicans have fought to close the 2015-16 budget and drive out vital funds to local schools, universities and hospitals. Unfortunately, none of these efforts have been embraced by Governor Wolf. Now, we are putting forth a plan to reverse many of Governor Wolf’s funding vetoes; further increase funding for education; and, by Standing Up For Taxpayers, close the fiscal year without new taxes. We cannot responsibly debate next year’s budget until we close the books on this year’s spending plan. We are thankful that Gov. Wolf is allowing this plan to become law, and we can get down to the business of negotiating the 2016-17 state budget. Read the timeline of the 2015-16 Pennsylvania state budget here. House Bill 1801 is a plan that passed in both the House and Senate with bipartisan support. This bill is a supplemental appropriation bill for fiscal year 2015-16 that provides $6.05 billion to restore line items vetoed by Gov. Tom Wolf on Dec. 29, 2015. - $872.6 million increase over 2014-15. This represents a 3 percent increase. - This plan spends $238 million less than House Bill 1460, portions of which the governor vetoed. - The plan spends within available revenues and does not rely on new taxes. This budget is balanced without the need for a tax increase; however, it is contingent upon the Secretary of the Budget lapsing the previously agreed-to $200 million in available prior year balances. Read the line-by-line appropriations here. Read General Fund financial statement here. 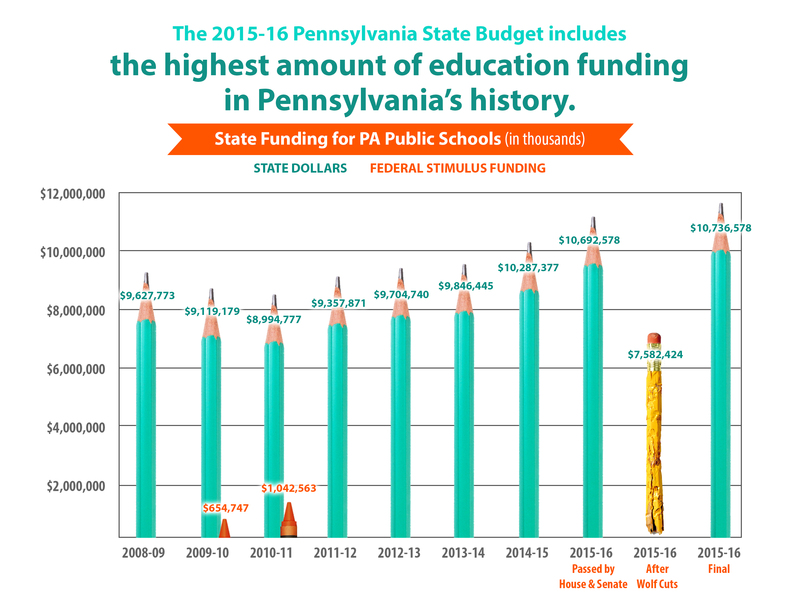 Prior to the governor’s veto, House Bill 1460 provided record funding for Pennsylvania schools. In working to close this year’s budget, we are now further growing that investment. Read the school funding investment, by school district. - The governor’s December vetoes cut tens of millions in funding for higher education. This plan reverses those vetoes for community colleges and the State System of Higher Education. It also fully funds Pitt, Penn State, Temple, PennVet and Lincoln. - As in House Bill 1460, this plan provides 5 percent increases in funding for these institutions over what was provided in 2014-15. - $50.55 million is provided for agricultural extension and research and includes $2 million to combat avian flu should an outbreak occur within the Commonwealth. This funding will ensure that 1,100 employees in the College of Agricultural Sciences and the Agriculture Extension Program will not be furloughed and that these vital programs can continue uninterrupted. - Restores $1 million for Child Advocacy Centers. - Approximately $3.6 million is restored for miscellaneous agricultural programs including Agricultural Research and Agricultural Excellence programs. - Restores $5.75 million for economic development programs within the Department of Community and Economic Development. - Provides $2.25 million for Heritage Areas and parks within the Department of Conservation and Natural Resources. - Restores $9.38 million for various disease-specific treatment, research and education programs within the Department of Health. - Provides funding for Obstetric and Neo-natal services, Hospital-Based Burn Centers and Critical Access Hospitals totaling $13.14 million. - Restores $3 million for Local Municipal Emergency Relief. • Require the Budget Secretary to lapse funds: This will infuse $200 million into the budget. • Philly Casino License: According to the administration’s Feb. 9 proposal, the awarding of this license will yield $50 million. • PHEAA Grants Shift: By covering $39 million in student grants, PHEAA will save the state budget an equal amount of funding. • Reducing Spending: To bring spending in line with revenues, certain reductions were made to control costs. This includes accepting some portions of the governor’s line-item vetoes. • Medicaid Savings: By closely examining the actual Medicaid Capitation spending during the fall and the corresponding federal matching dollars, this line was able to be reduced from what was originally passed in House Bill 1460. • Structural Deficit: A lower 2015-16 spending level reduces the structural deficit from $1.9 billion, as projected by the Independent Fiscal Office, to $1.3 billion for the 2016-17 fiscal year.